Looking up at a half-full room of students and followers in the massive T101 lecture hall, Siobhán admitted how crazy it was to be there, in a room she once avoided every Friday for maths lectures, to tell her story of success. 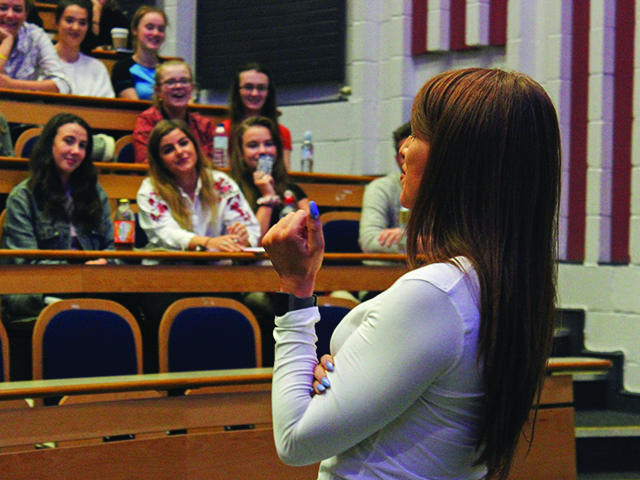 Accumulating over ninety five thousand followers on Instagram, running her own online business and giving talks to students on health and happiness, Siobhán O’Hagan returned to DCU last week almost unrecognisable from the girl she was when she graduated only a couple of years ago. Siobhán O’ Hagan is a personal trainer and social media star, known to many as ‘Instagram Goals’. Over the course of a few short years, she has traded in a life of working in an office crunching numbers Monday to Friday to become an online influencer and work for herself in her dream job. Most students filling the seats had some sort of gym gear on, meaning most were probably there to avail of her coaching expertise. However a few of us were intrigued as to how someone studying maths ended up as a sought after PT with her own online coaching course. “Initially the change came from a place of misery,” Siobhan said when asked why she left her old life behind. Once a financial and actuarial maths student, Siobhán always felt something was missing and knew deep down it wasn’t for her. She joked about how she thought it would be a good decision. “Actuary was the top paid job in Ireland” she said, but still she found herself booking a flight to Portugal to escape her own reality at any chance she got. Determined to achieve both health and happiness, the fitness coach said that the sense of freedom she feels now is the biggest change for her from living the nine to five office life. Having her own business and a massive media presence now is almost as if a weight has been lifted off her shoulders. “Not having to fit in with society and realising you don’t have to climb this career ladder, it doesn’t matter how much you’re earning or what your title is, and I think it was when I finally realised that, I had more freedom” she said to our reporter after the talk. Beginning her talk, she spoke of her early days in DCU, continuing on to the career she began afterwards, which she says she did because she thought she had to adhere to the socially accepted and expected ideal of having a ‘real job’. Through years of dreading work in the morning, meeting deadlines and occasionally booking flights at any opportunity, Siobhán explained how unfulfilled and unmotivated she felt at the time. Speaking of her decision to change her lifestyle in terms of health and fitness, she admitted she always had an issue with wanting to change her weight, stemming back to when she was younger, even though in hind sight she was never ‘big’ to begin with. Admittedly trying every fad diet under the sun growing up, she explained how it was lifting weights and learning about body building that ultimately changed her life for the better both health and career-wise. What began as a new fitness regime has catapulted her into major success as an online body coach and fitness inspiration to many girls, including many in the audience of T101. As questions rolled in about counting macros and calorie deficits, Siobhán kept referring back to how to her, it is now much more about changing your lifestyle and mind set than just calorie counting and fitting a certain weight category. When asked about her decision to pack up and leave her permanent job and stable contract for a career of uncertainty, Siobhán recalled a moment she realised she had no idea what would come next, but she knew she had to follow through with reaching her potential. Luckily, with 10,000 followers on Instagram behind her, it wasn’t long before Siobhán had built up enough of a following to keep her new career as a PT thriving. But again, she found herself working endless hours, barely maintaining a social life and all for the dream job that was supposed to bring a new-found freedom. With a touch of the travel bug and the desire to achieve a her goal of finding freedom in her work, Oh Fitness factory was born, followed by Oh Fitness Furnace, her own online coaching business. These were her key to living her life and achieving her goals while helping hundreds more more clients achieve theirs. As the hour came to an end, students began to pack into the lecture hall for their next class. The loyal followers escorted Siobhán downstairs to get some pictures and chat in person and while we waited for our interview and watched, it was apparent during the selfie session that Siobhán was at a point of realisation about how her life has evolved since she last visited DCU. It can be easy to settle for something that may appear easier or safer but in order to live a fulfilled life, it’s important to never lose sight of what makes you happy. In ‘Chasing Health and Happiness’, the title of her talk, Siobhán achieved what she came to do in “showing people that whatever they want, it is achievable”.